Relax and enjoy local food and wine grown right here in the Cowichan Valley. Restaurant dining options. YES, tasting fees are included! 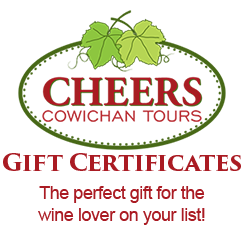 Cheers bus and driver can be booked as transportation for any local event or venue. See our options for “Other Tours” for more details. Wedding Venues, Restaurants, Hotels, B&B’s, Marinas, Private Residences, and more. Great way to get your guests HOME SAFE! Looking for a great treat for a mom in your life? Why not a great local Garden Tour? We’ll pick you up, drive you around, and admission is included in the cost! Click the button below to register and for more information! We offer stress-free, fun destination tours in the beautiful Cowichan Valley. We specialize in Winery Tours, but offer lots of other stops as alternatives or add-ons. Hop aboard our 20 or 18 passenger busses with driver & guide for a delicious, memorable day. Also available: 11 passenger van or 4-7 passenger private car.